I made this card for the Wild Orchid Challenge "Classic Christmas". 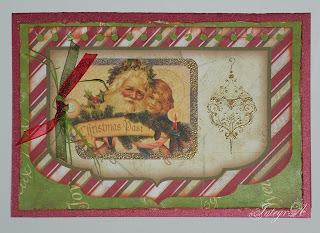 I used cardstock, BoBunny Noteworthly "Noel", Graphic 45 Christmas Past Tag, embossing powder Zing with glitter, stamp Inkadinkdado, ribbons. Thanks for your visit to my blog! Очень приятная открыточка, спасибо за участие в задании Скрапмамы!